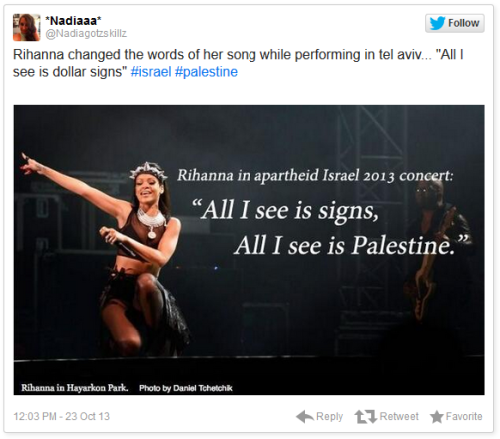 The pro-Palestinian gesture was carefully recorded by pro-Palestinian websites and blogs, accompanied by declarations about how “it seems Rihanna’s heart is in one place – Palestine.” But her wordplay was also noted by mainstream sites like Huffington Post and Buzzfeed. But it turns out Rihanna didn’t actually change the song’s lyrics. 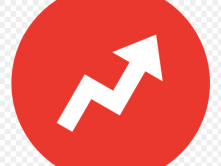 The Jewish Journal found the root of the viral error: Ha’aretz. 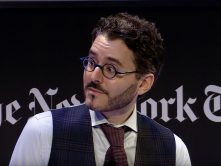 Amy Klein, the Ha’aretz correspondent who reviewed the concert for the English edition of the newspaper, was the one who first propagated the rumor about the changed lyrics. 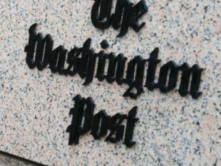 Her editor, moreover, decided it was the most newsworthy part of the review to highlight in the article’s headline — and that the piece should appear on the front page of the newspaper. Nor did [the Israeli fans] care when in “Pour it Up,” instead of the lyrics “All I see is signs / All I see is dollar signs,” she subbed in “All I see is Palestine,” or the fact that she just kept inserting calls of “Tel Aviv!” in every song — never once saying the word Israel. It is also worth noting that Ha’aretz‘s Hebrew edition, which published two items about Rihanna’s visit to Israel, said nothing about the supposed lyrical switch. In other words, it’s not that Ha’aretz was the only one to have heard the pro-Palestinian singing; it is that the reporter from Ha’aretz‘s English edition was the only one to have heard it. This farcical situation again reminds us of the power of the mainstream media, most notably the power of a headline and, in this case, Ha’aretz‘s English edition, which reaches so many more readers than its Hebrew edition. 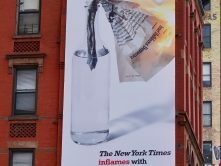 Because one reporter heard voices, millions of people worldwide received inaccurate information. When someone on Twitter asked Lahav Harkov why she made such a big deal of the story, she responded, “I was there, I didn’t hear her say it, and I find dishonest journalism upsetting, so I made something of it. 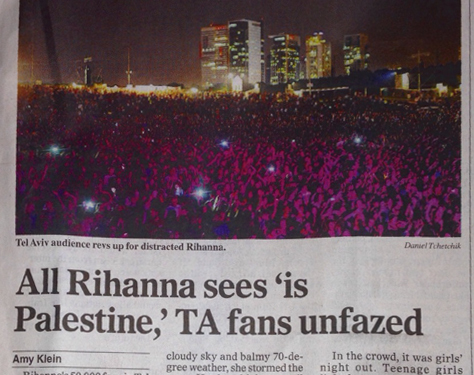 The original headline for this article has been changed (from “All Rihanna sees ‘is Palestine,’ but Israelis didn’t seem to care”) and part of a sentence was removed from the story (“in “Pour it Up” instead of “All I see is signs / All I see is dollar signs,” she subbed in “All I see is Palestine.”) Upon reviewing video footage of the show posted after publication, it is clear that the change in lyrics attributed to Rihanna was mistaken. 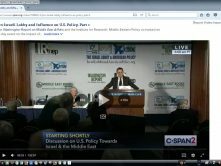 The footage can be found here. 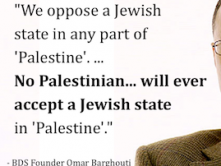 This article was translated from Hebrew. The original piece can be found here. For additional Ha’aretz corrections prompted by CAMERA and our Hebrew site, Presspectiva, please see here.